Unfortunately the weather in Thailand was not cooperating with us. We were there for 7 nights and we probably had two days of sunshine. Lots of rain and mud puddles which caused us to find recreational activities inside… There isn’t much to do on an island when the weather is bad, especially Ko Phi Phi. We kept ourselves entertained with lots of stories and laughs from our trip, food, and an adult beverage or two. I finally got the chance to meet up with my friend from high school, Fallon who started teaching in Thailand in March. It was so awesome to catch up with her, reminisce on life in Syracuse and bond over our unexplainable desire to find what we need out of life even if that means traveling all over the world to find it. As the rain fell the reality of the end of my journey getting closer and closer washed over me. We didn’t want to talk about moving home because that made it real. I was so excited to see my friends and family, meet my nephew, squeeze my puppy, eat real pizza and finally feel clean but I couldn’t help but hate having to leave behind this place that I have learned to call home. Thailand is a magical place for many but for me it changed my life in a way I will always revere. Thailand taught me what it means to be myself. That is the most beautiful gift anyone can give you. By no means did I feel “lost” in life before, but Thailand opened my eyes to a world I needed so desperately to see. A world beyond sorority formals and football tailgates. A world where people don’t have shoes on their feet or have to share a small room behind their restaurant with 13 family members. A world full of dreamers, teachers, and travelers; young people who have the same desire to see new horizons as I do. Like I said in an earlier piece, I joined a club I didn’t know existed. There are so many people, so different than I am, who went to different unis, speak different languages, were raised in diverse situations that have the same fire burning inside of them. This fire can not be extinguished or “gotten out of your system”. There is a whole world full of people who want to experience life, other cultures, have heart to hearts at 3 am on cruise ships in Vietnam, explore ancient temples in Cambodia, eat traditional Indonesian food at 6 am with locals and talk to strangers about their lives simply because it matters. I am so grateful for each and every one of you I have met along the way and you have inspired me to continue dreaming, no matter what anyone thinks. Thai people, especially my students, coworkers and friends, taught me more about the world then they will ever realize. They are so kind hearted, unguarded and generous it blows my mind. A Thai person would literally and figuratively give you the shirt off of their back if you needed it. They focus on what matters in life and they refuse to let the troubles of life get the best of them. Sometimes this made life difficult for a foreigner living in Thailand because they truly do operate on their own “Thai time”. It is hard to get accustomed to this as a professional educator and a New Yorker, who expects everything to happen how I want and when I want it. Thailand taught me to be patient and to let life come to me. You can’t always be in control and you surely are currently worried and stressed about things in your life that don’t have real significance. I wasted so much time in college being stressed about things that now I realize have no relevance to the world as we know it. Not only did Thailand change my life but it changed my eyes. It changed my definition of “clean”, “luxurious”, “good English”, “spicy” , “hot”, “simple”, “kind”, “beautiful”, “smile”, and most importantly….“me”. Coming back to America was something that I thought about A LOT. I was sure that reverse culture shock was going to be incredibly difficult to deal with. After a few weeks in America, I can say that I am only in shock by how normal it feels… A parallel universe. My first weekend back in NYC I was greeted by my father, my brother, sister-in-law, niece and nephew and too many friends to possibly list. I ate more pizza, bagels and took more fireball shots then any human being should. I froze to death and cried like a little brat about it to my friends. The love and support I felt from the people I care about was overwhelming. It has brought me to tears just about every day since I’ve been home. But just like that I slipped back into life here… a parallel universe. America is the same…but now I’m the piece of the puzzle that is different. When people ask me, “How was Thailand?” I truly don’t know how to answer that question. I semi-jokingly ask, “How was the past year of your life?”. It is impossible to condense that into a blanket statement given over coffee or in passing at the bar. Thailand was my life and it is now a part of me forever. 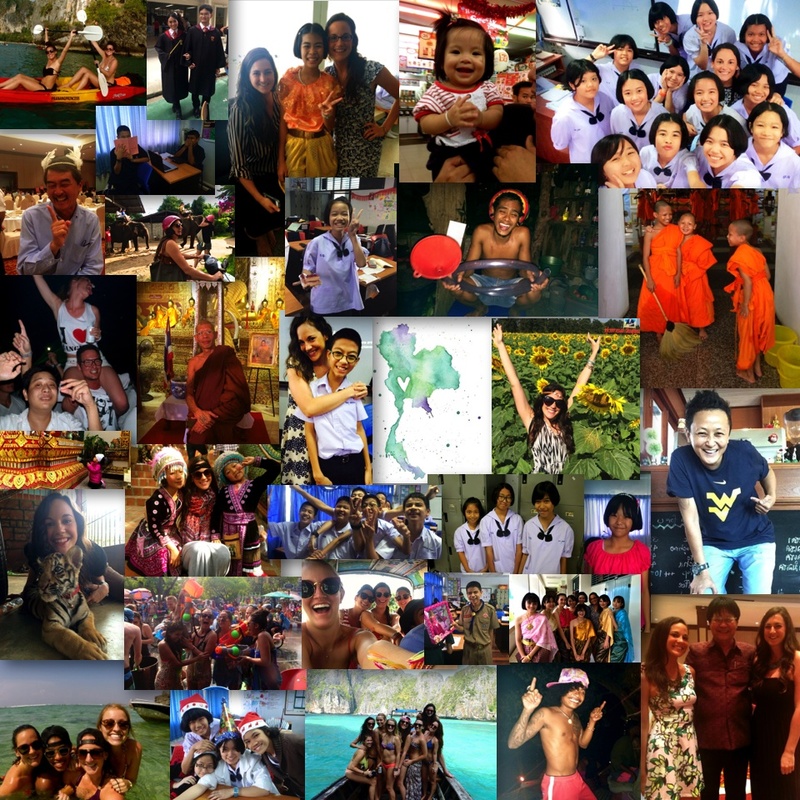 Living in Thailand was the most rousing, stimulating, demanding and eye-opening year of my life. I have tried to verbalize it throughout the year through my blog but there are so many stories left untold. There are so many smiling faces I wish I could bottle up and keep with me forever. There are so many temples, mountains, hidden beaches, meals, alley-ways, van rides, 7-11 trips, charade games, karoke sessions, and sweaty bus rides I will always remember. I plan to make this journey into a novel before those memories slip away. What I experienced as a 24 year old American teaching and living in a small town in South East Asia, traveling the world, dealing with heartbreak, meeting some of the best humans, so good I couldn’t write fiction characters better than them, is a story I need to share.